Who's watched Straight out of Compton? It's pretty dope! But LA isn't just home to the world's best rappers, it's home to some of today's most promising startups, such as SnapChat, Whisper, The Honest Company, DollarShaveClub and JustFab. In fact, recent fundings into SnapChat, DollarShaveClub and The Honest Company this year have driven LA VC investments up 5X in five years. Good timing for Vator Splash LA, our popular startup event, which will once again feature LA's top founders and CEOs of the startups aforementioned. According to data supplied to VatorNews by Dow Jones VentureSource, $3.2 billion was invested in 105 deals, in the first half of this year (though $250 came from Realty Mogul, which was not actually an investment but rather a line of credit). Nonetheless, according to DJ's data, even without Realty Mogul, the financing activity is up 5X from five years agao. During the same period in 2010, only 59 companies raised $373 million, meaning in five years, the number of deals nearly doubled and the amount of money has surged 5X. That number is not quite as high, depending on who you ask, though. According to CB Insights, the first half of 2015 has already seen 182 deals with $2.1B invested, putting it on track to break $4.2 billion by year-end, a 285% increase in funding from 2012. Seven years ago, $788 million amount was invested. The largest deals in LA companies so far this year, based on CBI data, are two rounds into Snapchat, its Series E, for $338 million and $200 million, followed by $186 million growth equity into Lynda, and $100 million to Chrome River Technologies. Regardless of which data you look at LA is super hot right now. Some of the activity can be attributed to the startup ecosystem maturing. 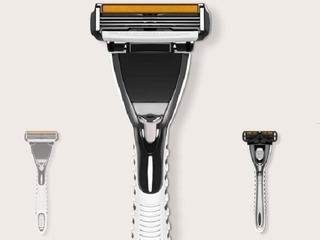 LA-based Dollar Shave Club, which was founded in 2011, raised $75 million last quarter. Founder and CEO Michael Dubin will join us on stage at Splash LA! (Don't forget to get your half-off tickets with the Labor Day Sale, which ends on Monday, Sept. 7. Register here). While L.A. is growing, it's still lagging behind one other important tech ecosytem, New York, which saw 250 deals over the first two quarters of 2015, with $4.5 billion invested. Yet though the tech scene in New York is maturing quickly, LA is actually narrowing the gap between the two: at this time five years ago New York had 196 deals, and $1.2 billion raised. That means that New York went from having three times as much funding, and nearly four times as many deals in 2010, to now having less than 1.5X the amount of funding and roughly 2.5X the number of deals. Boston is more on par with LA at the moment, as 195 startups investein, but with the same amount raised, $3.2 billion, according to DJ's. LA is also ahead of two up-and-coming cities: Austin, which is roughly in the same place that LA was five years ago, with only 44 deals and $383.5 million raised during the first half of the year. It also beats out the scene in Seattle, which saw 64 deals but a surprisingly high $1.1 billion raised over the first two quarters. Maybe Seattle is a scene we should be keeping an eye on. Of course, the San Francisco Bay Area blows all of them out of the water, with more deals and money than all of them combined. It saw 652 deals in the first half of the year, and a total of over $15 billion raised. To put that in perspective, that means that the San Francisco Bay Area is on track to invest more than what has typically been invested by the entire venture industry in the US. If you look back over the data since 2003, the VC industry has invested about $32.1 billion on average every year. In addition, there has been $35 billion raised in all regions of the United States in the first half of 2015, giving the Bay Area 42% of all dollars raised. In 2014, Bay Area startups raised roughly half of all VC dollars, $28 billion out of $57 billion. What sectors are attracting investment? So we know which companies are driving the big money raises, but what sectors are driving deals and dollars in LA? When it comes to number of deals, the largest by far was consumer services, with 24 deals in the second quarter of 2015. In fact, if you look back over the last five years, consumer services accounted for 40 percent of all deals done in Los Angeles. That sector did not come close to having the most by amount raised, though. While consumer services companies raised $247 million during the quarter, that was dwarfed by business and financial services, which raised $418 million, as well as healthcare, which raised $326.6 million. Both of those sectors had only 11 deals in the quarter. The other sector driving growth was information technology, which had the second highest number of deals during the quarter, with 13, but the lowest amount of money raised, with only $53.9 million. These stats show something very interesting about Los Angeles: that it seems to be split into two camps. Two of these categories seem to be pretty early, with a lot of companies raising funding, but with smaller rounds. The median round size for consumer services was $5 milllion, and only $3 million for information technology. On the other side you have two sectors with lower numbers of deals, but higher amounts being put in. The median round size for both business and financial services, as well as healthcare, was $12.5 million. And when it comes to the most active Los Angeles-based venture capitalists there are two that lead, followed by five more that are tied. Upfront Ventures, located in Santa Monica, has made seven investments this quarter, including GumGum, an in-image advertising platform for publishers and brands; Daily fantasy sports platform AlphaDraft; and Silversheet, a medical credentials verification platform. Wavemaker Partners made five total investments in Q2, including Cursive Labs, a venture studio/incubator; 3D printing pen creator CreoPop; and Pie, a Singapore-headquartered enterprise messaging service. Rincon Venture Partners, Crosscut Ventures, New Enterprise Associates, Double M Partners and Slow Ventures were all tied for three investments each. Raising more money is only one sign of a maturing ecosystem; the other is the number of exits that a region is seeing. 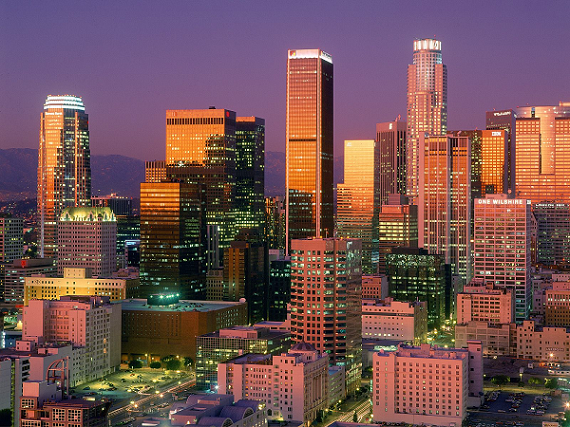 Los Angeles has been growing in terms of exits for the last few years, nearly quadrupling the number between 2010 and 2014, going from 31 to 124, according to CB Insights. Out of the 128 tech LA tech exits that occured in 2014, four of them were IPOs, including Rubicon Project and TrueCar, both of which were valued above $500 million at the time of theur IPO. 2015 is so far continuing to grow, with 77 exits so far. 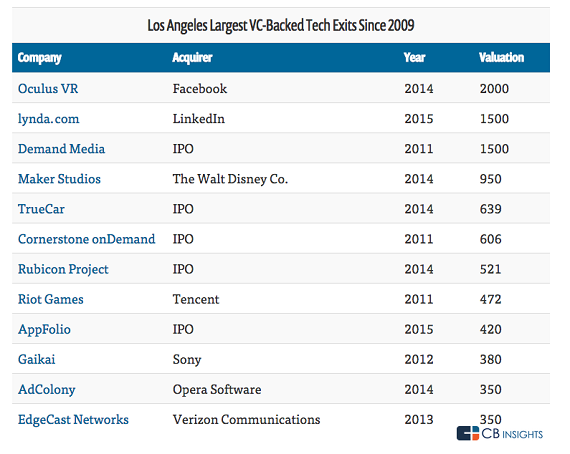 Here is the list of the top exits of LA companies since 2009, with Oculus, which was bought by Facebook last year for $2 billion leading the pack. 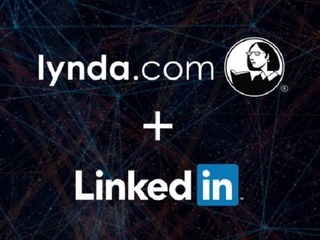 That is followed by LinkedIn's purchase of Lynda.com for $1.5 billion earlier this year; Demand Media, which was valued at $1.5 billion in its IPO in 2011; and Maker Studios, which was bought by Disney for $1 billion last year. The lynda.com Online Training Library® and CD-ROM titles include such subjects as Photoshop, Flash, Dreamweaver, Illustrator, Office, digital photography, Web design, digital video, and many others. lynda.com's all-star team of trainers and teachers provides comprehensive and unbiased movie-based training to an international membership of tens of thousands of subscribers. Considering the speed at which technology evolves, the Online Training Library® is a great solution for keeping your skills current. Library subscriptions begin as low as $25 a month, with no long-term commitment required. lynda.com celebrated ten years online in 2005! RealtyMogul.com launched in 2013 with one mission: simplify real estate investing by connecting real estate companies and investors through cutting-edge technology. Today we are a leading online real estate capital marketplace, offering commercial equity and commercial debt products nationwide, educating our investors, and building a company that will change real estate investing and financing forever. RealtyMogul.com brings over 200 years of collective experience underwriting, managing, and acquiring over $5 billion in real estate across asset classes and markets nationally. 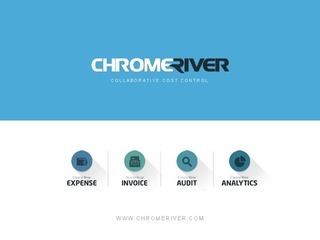 We have made significant investments in Data Science, Technology, Legal and Operations. Our core value, “Access Through Innovation” and our commitment to “Investor Protection” inspire us to bring the best experience to borrowers and investors alike. Since our inception, RealtyMogul.com has funded over $190MM, totaling over $700MM in aggregate property value. Our crowdfunding investment platform has grown past 23,000 accredited investors. To date, RealtyMogul.com has returned over $25MM in principal and interest to our investors. RealtyMogul.com’s growth story continues in 2016. With six locations in San Francisco, Irvine, Houston, Atlanta, New York City and a major expansion at our Los Angeles headquarters, we are poised to lead the online real estate investing revolution.